Working with the El Salvador government to integrate low carbon and climate resilience into the environmental impact assessment process and modelling natural disaster risks to critical infrastructure in order to strengthen the country’s disaster preparedness, response and climate resilience. The Infrastructure Risk Framework (IRF) is used to generate estimates of risk from natural hazards (for example floods, earthquakes, and landslides) to key infrastructure for national reporting and as a sustainable framework to be regularly updated as datasets and parameters are refined. The framework is open and flexible and is designed to be easily updated and managed without requiring extensive development expertise. It uses Annual Average Loss (AAL) as a measure of risk that incorporates information on the locations of infrastructure, the spatial patterns and intensities of natural hazard scenarios, the probability of those scenarios, and the sensitivity of the infrastructure. The Infrastructure Risk Framework was developed by ESSA in close collaboration with the Ministry of Environment and Natural Resources of El Salvador (MARN) and the agencies responsible for infrastructure management. El Salvador is a small and densely populated country in Central America that is highly vulnerable to natural hazards including floods, landslides, earthquakes, volcanic eruptions, and tsunamis but has limited data on those hazards and specific infrastructure characteristics. The IRF is designed to be able to use the best data currently available without requiring a lot of new data to be gathered for a first analysis. Infrastructure Features form the main input to the analysis: A list of features for each infrastructure type, each with a replacement value, and a location are specified in the GIS. Parameters and Hazard data: A set of hazard scenarios each with mapped intensities and return intervals/probabilities along with other parameters along with a set of parameters including damage curves specifying the level of damage expected from the different intensities of the hazards. Processing: A script tool processes the input features to determine hazard intensity from each hazard scenario and then uses the damage curves to estimate the percentage damage to each feature from each hazard scenario. 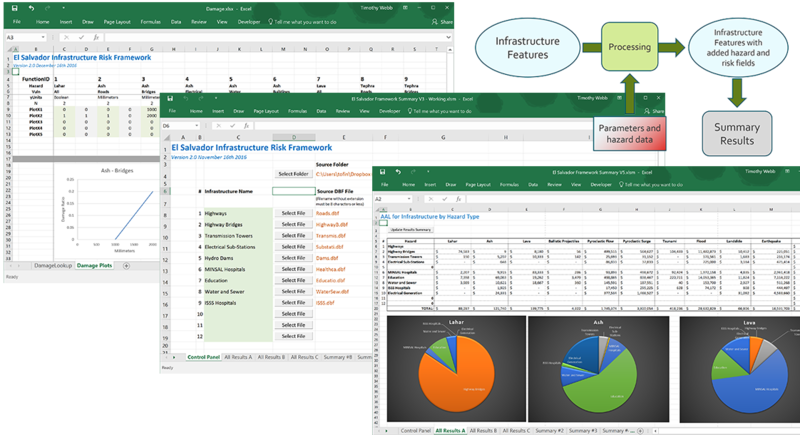 Summary Results: Infrastructure features with the added AAL and related data are exported form the analytical framework and then imported into an Excel summary spreadsheet which contains macros to produce summary tables and charts. 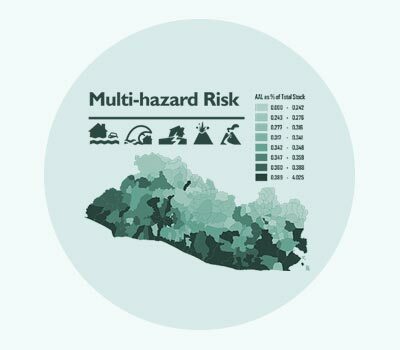 Results can also be displayed as risk maps with results at different levels of aggregations, for example at the municipal level. The IRF is built on ESRI and Microsoft technology and uses ArcPython scripts for spatial analysis, Microsoft Excel for parameter input and results presentation, and Excel VBA macros for non-spatial analysis; ArcMap is used for GIS data preparation and map presentations. The framework is accessed through a user-friendly interface developed in Python. This architecture makes it easy to repeat analyses with changed parameters, add new vulnerabilities, and customize data presentation without the requirement for extensive programming expertise. Contact us if you have any questions or would like to discuss the current or future El Salvador Infrastructure Risk Analysis Framework.